When you don't have a kitchen to cook in, you have to harvest your food from the wild. In the urban jungle, fast food is the most commonly available native foodstuff. It will keep you alive for a few days, but if you eat too much of it, your digestive system will rebel. (Believe me, it will let you know!) For free sleeping to be sustainable, you need to draw on a variety of food sources and strive for a balanced diet. Our ancestors were omnivores, meaning they ate just about anything that came their way: meat, berries, grubs, occasionally even each other. As long as you consume a varied diet, not just from the fat and sugar groups, you'll probably be okay. Fast food is not a varied diet, but if you throw in a few vegetables, some seafood, salad and fresh fruit, you might be okay. The only trouble is, where do you get those other things? One solution is the "buffet"—a restaurant that lets you assemble your own meal from a wide variety of options. If you have been to Las Vegas, you are familiar with the concept, since casinos use extravagant buffets to lure suckers in the door, but the concept exists everywhere in some form. From the lowly salad bar to the venerable Smorgasbord, there is bound to be something like that near where you are. If you hit the buffet a couple of times a week, deliberately grazing for the foods you are missing, you might end up with a decent diet overall. 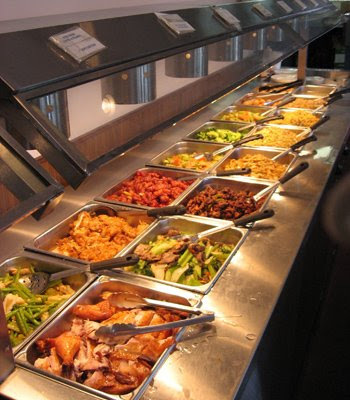 In North America, Chinese buffets are the most common. Nearly every city, big and small, seems to have them, mostly independently run. Here you will find vegetables and a lot more, not all of it strictly Chinese. In fact, the "Chinese" food served in America seems a far cry from what is actually eaten in China, but let's not quibble. If it works, it works. There are also several restaurant chains to look for: Hometown Buffet/Country Buffet is a good one, not Vegas quality but offering a decent range of items for under $10. Sweet Tomatoes/Souplantation offers a "salad bar" that is essentially a buffet, including fresh soups, pasta and baked goods, also for under $10. The Sizzler steakhouse chain has a salad bar that may also include hot food like chicken wings. Other steakhouse chains with a big salad/food bars are Ponderosa and Golden Corral. There are many similar non-chain buffets & salad bars locally. Don't overlook Indian buffets. Truckstop buffets, however, are often gross! Don't go unless you can see the food first or get a recommendation from someone. Wherever a restaurant offers a salad bar, there's really no need for an entrée, since you'll probably fill up on salad before the entrée even arrives. Some regional options include the legendary casino buffets of Las Vegas. (I recommend The Orleans and Main Street Station for a good balance of price and quality.) Manhattan has many to-go salad bars sold by the pound. Tourist areas in the Eastern U.S. often have "Smorgasbords" (a buffet by a different name) of regional renown. Look around you; you'll see something that works. Some buffet advice: (1) Don't buffet every day or you'll explode (or at least your waistline will). Once or twice a week is sufficient. (2) On your first pass through the buffet line, pick out the things you know you should eat, based on what's been missing from your diet. On the second pass, you can go for what you want to eat. (3) The lunch price is usually cheaper than the dinner price, even though the food is nearly the same, so go for lunch when you can. (4) Avoid breakfast buffets, as the variety isn't as good and you'll feel bloated all day. (5) Try to starve yourself before you buffet to maximize your intake. (6) Know your limits! Most people, when faced with an all-you-can-eat buffet, will eat all they can eat, which isn't necessarily good in the long run. Remember, this is a nutritional exercise not a gastronomic one. Try to eat healthy! We'll talk about other native food sources later. Don't You Need a Permanent Address?